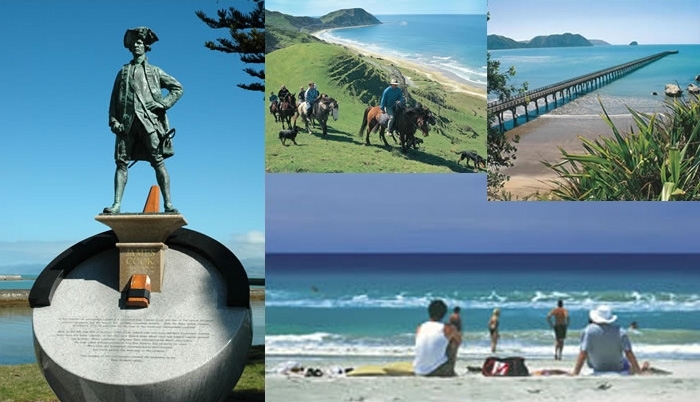 Gisborne is the main city of the Eastland region and a great place to explore surrounding areas including Mt Hikurangi, the Pacific Coast Highway, Eastwoodhill Aboretum, Lake Waikaremoana and Mahia Peninsula. Visit a winery and indulge in a drop of local chardonnay. Relax on a beautiful sandy beach or swim and surf some of the best waves in New Zealand. Go fishing, either deep sea, fly fishing, or freshwater; there are world-class opportunities everywhere. Stroll the cafés, restaurants and bars of the vibrant harbour overlooking the picturesque wharf. Dine on fresh local produce including seafood, cheese, fruit, vegetables and of course wine. Visit Kaiti Hill for superb city, harbour and beach views. Swim at Waikanae Beach or picnic in the Titirangi Recreation Reserve. Short walk to Gisborne Skatepark and camping ground.